A Maiden Fillies' Stakes over 1M 5y on Standard going. Six runners. Three with race experience. A couple of those priced 150/1 at the time of writing. Sir Mark Prescott has Melodine who is making her second start for owner-breeder Miss K Rausing. This American-bred daughter of Archipenko is out of a dual winning mare who raced in France. Melodine was sent to the sales this month but withdrawn. This chestnut filly was relatively unfancied on debut when racing at Kempton over one mile. She wasn't disgraced in sixth place, giving the impression she would improve for that initial start. The betting is key. If priced 13/2 & less SP holds fair each-way claims. Conversely, if weak in the market best watched. The three debutantes make most appeal. David Simcock can ready a horse making its racecourse bow. Dalavida is a French-bred filly by Kendargent out of a once raced mare. This grey cost 68,000G at the yearling sales. She has a hood applied for this first start. With such a small field betting guides have to be taken with a pinch of salt. Interesting. John Dance has horses with a number of trainers. Hot Natured will be handled professionally by Karl Burke. This bay filly is a daughter of Canford Cliffs out of a mare called Teddy Bears Picnic who, herself, was unraced. Hot Natured cost £68,000 when purchased at the yearling sales and related to Nezar who has been a fair horse for John Quinn. Burke's debutantes can go well and they feature fair win and place claims when single-figure odds.Once again, the nature of a small field makes it a touch difficult to be dogmatic about this three-year-old's claims. If drifting to over 10/1 SP, I would take a watching brief. For many pundits, this race will start and finish with Signe. This bay filly is a daughter of Sea The Stars out of an unraced mare. She comes from a good family including Lord Shanakil & Together Forever. Clearly, this April foal must have been a good looker because she cost 1,100,000E when purchased at Goffs Orby Yearling Sale in 2014 by Amanda Skiffington. William Haggas trains this expensive four-year-old. It is interesting to consider why she is making such a belated appearance. She must have suffered some form of injury. It would seem likely owners Carmichael Jennings are intent on gaining a win to make this a very expensive broodmare. It would be intriguing to know the conversations behind this engagement especially if she is limited. They may have been waiting for such a race for a very long time! With such a huge price tag and lofty connections, it is no surprise to see she is priced odds-on. The downside for this filly is that she has to carry a 19lb age penalty. Make no mistake that is a heavy burden for any horse especially taking its formative race. Conclusion: A fascinating race in lots of ways. Signe is the talking horse. I'm intrigued how she fares carrying such a big weight against these three-year-olds. 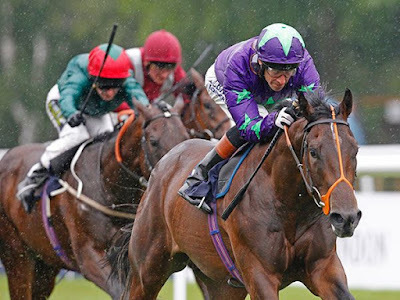 Racing over a mile may help negate any inexperience and as the major players are making their racecourse bow it may give connections a good reason to consider winning today. Dalavida, Hot Natured, and Melodine hold claims. Sir Mark Prescott's charge may try to make the most of her experience. I would have to take a watching brief but excited by this race.